On the 15th anniversary of the 9/11 terrorist attacks, members of the PawSox community set a club record by donating 71 units of blood for the Rhode Island Blood Center at McCoy Stadium. 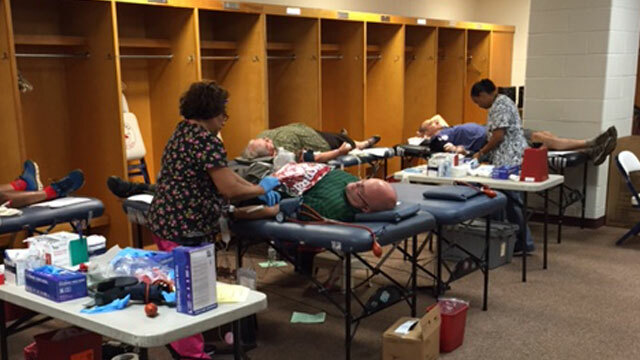 PawSox blood drives in past years garnered less than a dozen units. Yesterday's Day of Remembrance Blood Drive was the first on this date in PawSox history. In previous years, a blood mobile visited McCoy Stadium before a game. An average of five-to-seven fans participated. Yesterday's total, more than 10 times more, far exceeded the expectations of the Rhode Island Blood Center. "To see a sports franchise so committed to the well-being of its community is a real source of pride for Rhode Island," said Eric St. Peter, Account Manager/Public Relations Coordinator at the Rhode Island Blood Center. "We should be proud to have such a great club with such great fans who understand the importance of life-saving blood donations here in our state." "We are pleased that the PawSox could play such a meaningful role on such a special day of remembrance," said PawSox President Dr. Charles A. Steinberg, who was instrumental in the creation of the Boston Red Sox' Annual Blood Drive that has taken place at Fenway Park each September 11 since 2002. "This inspiring show of support is a tribute to the people of Pawtucket, who demonstrated their heart in record numbers."